In this article I will be showing you how to make your very own crochet giraffe. Sharing my easy to follow crochet giraffe pattern, with clear instructions for stitching and sewing together too. 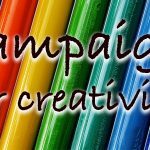 Not to mention some great ideas for ways to make the pattern unique. 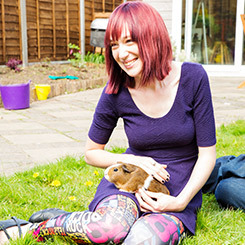 Crochet toys are enduringly popular. Giraffes are iconic, instantly recognisable and gorgeous too. Before we get started, let’s take a look at what you are going to need. Creating a crochet toy always requires a bit of extra effort with regards to equipment. Even if it’s just in the procurement of toy stuffing. For this pattern we also switch hooks a couple of times, so make sure you have everything ready before you begin. If you are happy with reading crochet patterns you can skip straight down to the pattern. But if you need a quick clarification we will take a brief look at the stitches and techniques here before we begin. The main stitch we will be using in this pattern is the single crochet (sc). 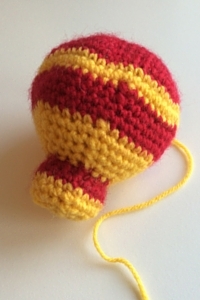 To put together your crochet giraffe pattern you will mostly be working this stitch in a round. This involves making simple increases and decreases from a central magic circle. You can find a tutorial with a video guide to making a magic circle here if you are unsure. 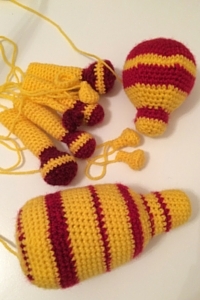 In order to make the right shapes for this crochet giraffe you will need to crochet increases and decreases confidently. To increase the size of a row you will add in single crochets. In the pattern a single crochet will be written as ‘sc’. A number will usually be given before this, and this tells you how many single crochets to make in the stitch. Where you need to crochet an increase, the instruction will be ‘2sc’. This simply means put two single crochets into your next stitch. By putting additional crochet stitches into your row you literally build up the size of it. To decrease the size of a row you will need to remove stitches. This is not as simple as just not crocheting into a stitch as this would leave gaps in the row. What you need to do instead is crochet two together. This will be noted as ‘sc2tog’. The abbreviation for ‘single crochet two together’. To do this begin your single crochet as normal by inserting the hook through the next stitch, picking up the yarn and pulling it through. Next, put your hook straight into the following stitch as well and hook the yarn through there two. You will have three loops on your hook. Yarn over and pull the yarn through all the loops on the hook at once. Thus turning two stitches of space into one stitch. If you’d like to find out more about reading crochet abbreviations, check out this handy article. I have tried to put each instruction in full before abbreviating in the pattern too, for ease of following for newer crocheters. If you have any questions whilst you are making him, just put a comment below and I will get back to you as quickly as I can. 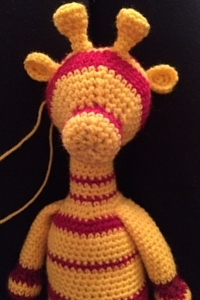 Your crochet giraffe will be created in sections which are sewn together upon completion of all of the composite parts. 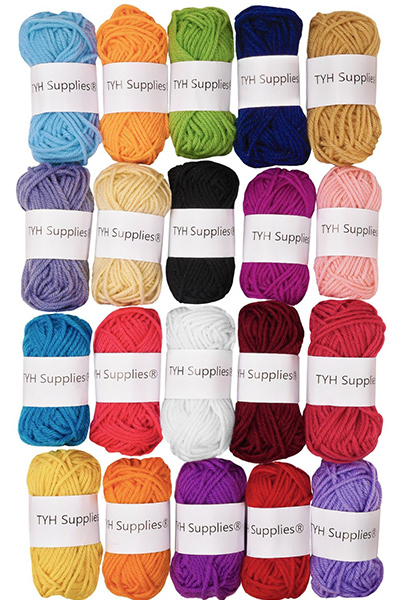 We will switch within the patterns between yarn colours and occasionally hook sizes, so make sure you follow each line carefully as we go along. For the body sections we will work in continuous spiralling circles. The stitch count of each row will be given in brackets at the end of the instructions for that row. Pause your crocheting at this point and proceed to stuff the head. Make sure that you get filling in every part, but do not overstuff. The head should maintain the correct shape without being rigid. If you squeeze the sides it should have a small amount of give. It’s actually better for the head to be slightly understaffed than over, so err on the side of caution here or you will end up with bits of stuffing showing through your stitches. Row 26 – To close the head at the nose sc2tog until the gap is closed. Then cut off with a long tail. Sew the nose closed and weave the loose thread in toward the back of the head where it won’t show. Pull the end of the tail out at the point you will want to attach the head onto the neck later. 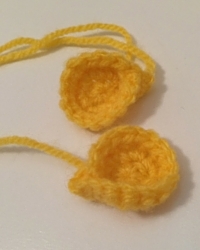 Start your work in yellow yarn using your 4.5mm hook. Slip stitch to join and sew in some of the loose yarn, leaving a long tail. Obviously, giraffes don’t have arms. However, yours will. It’s a toy thing. I prefer the giraffe with a difference between his so-called arms and his legs. Begin using your red yarn and the 4.5mm hook. At the end of the row cut and leave a long tail to be sewn in later on. 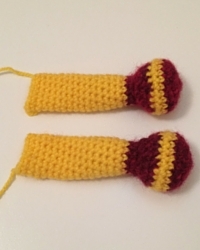 Keeping with the style of the arms, the pattern of the legs will begin with the red yarn, working in the 4.5mm hook. 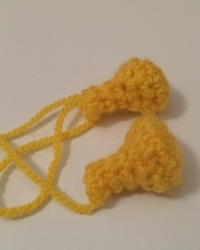 For the giraffe’s ossicones you will only need the yellow yarn and your 3.5mm hook. You will need to make two horns for your giraffe. Slip stitch to finish off securely, ready to be attached to the head later on. 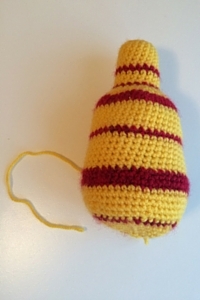 To make your giraffe’s ears you will need yellow yarn and your 4.5mm hook. When you have finished cut off a long tail. Attach your yarn needle and sew into the stitch 4 spaces from the finish point to create your ear shape. You will then sew along the line this leaves when you attach each one to the head later on. Your tail is made differently to the rest of the giraffe. You will be working from a chain rather than in a round. You will need your 4.5mm hook and to begin in yellow. Cut off a long tail and sew the long edges of your crochet together as a tube. Slip stitch to secure. The taking your red yarn, slip stitch to join one end of the tube. Then make a series of six loops for the haired part of the tail by chaining 10 and slip stitching into the end between chains. Once you have made the composite parts of your giraffe you will need to join them together. Do this using one yarn needle for sewing and the other to hold the opposite piece in place to make sure they are balanced. Sit the giraffe’s arms at his side, but attach the legs at an angle to allow him to sit. The tail attaches at the base of the giraffe, angled to one side. The ossicones sit slightly further forward on the head than his ears. When he is joined together take your yarn needle and black yarn and sew two eyes in the position of your choice. Remember the slope of the eyes will change his expression, so before you put them on sketch a few ideas on a piece of paper to see how they will look before you commit your needle to his head. Crochet toy patterns allow some versatility. 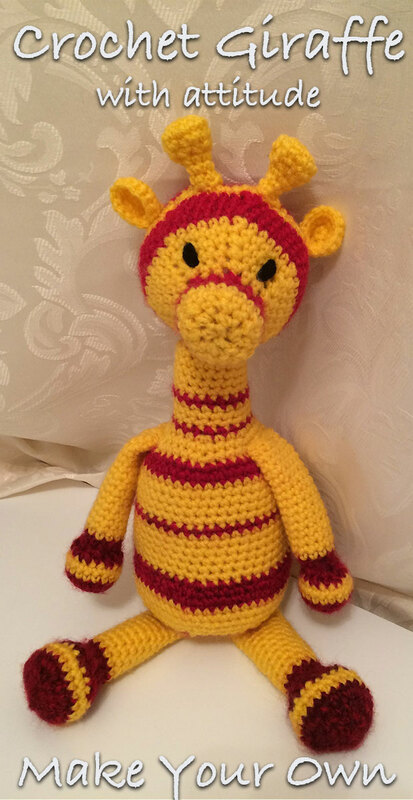 To make this crochet giraffe pattern your own you can do more than just change the shape of his eyes in yarn. You could swap yarn for safety eyes if you have any handy. Or you can change the colour combinations. Making closer lined patterns, or if you are more confident in your crocheting you can affect a dotted pattern more akin to an actual giraffe. Bright colours on giraffe toys also work really well for kids, with bold rainbow stripes looking stunning when done well. As with most patterns, try sticking with the same type of yarn and hook size to avoid the pattern style going wrong. Most importantly, have fun and I hope you enjoy making your very own crochet giraffe too!